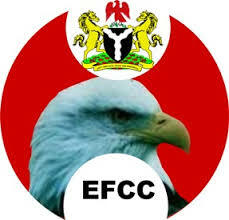 The Economic and Financial Crimes Commission (EFCC) has frozen over N126billion in the accounts of some suspects in order not to jeopardise investigations, the agency said yesterday. More than 120 bank accounts are affected by the freeze order. About N126,563,481,095.43 was temporarily seized by the EFCC pending the conclusion of corruption-related cases. Other cash and assets under Interim Forfeiture is $9,090,243,920.15, seized from suspects facing trial or under investigation. Apart from freezing of N32.8 billion from six suspects implicated in the Police Pension Office, some high profile suspects with accounts among the over 120 frozen include ex-Minister of Petroleum Resources Mrs. Diezani Alison-Madueke, ex-National Security Adviser (NSA) Col. Sambo Dasuki (retd), ex-Chief of Defence Staff Air Chief Marshal Alex Badeh; ex- Chiefs of Air Staff Air Marshals Adesola Amosu and Mohammed Dikko Umar; Robert Azibaola( ex-President Jonathan’s cousin) and ex-Minister of Aviation Femi Fani-Kayode, among others. The action of the EFCC has generated criticisms, with most suspects claiming that the freeze was prejudicial. But the Head of Media and Publicity of EFCC, Mr. Wilson Uwujaren, in a statement, said the anti-graft agency was not being vindictive. “In order to prevent misinformation, it is imperative to explain the reason behind the Commission’s actions in this regard. “Freezing of accounts suspected of being used for commission of financial crimes is a mandatory investigative step backed by law. Indeed, Section 34 (1) of the EFCC Act 2004 empowers the Commission to freeze any account suspected of being used for financial crimes. The section stipulates that “the Chairman of the Commission or any officer authorised by him may, if satisfied that the money in the account of a person is made through the commission of an offence under this Act or any enactment specified under Section 6(2) (a)-(f) of this Act, apply to the court ex-parte for power to issue or instruct a bank examiner or such other appropriate authority to freeze the account”. “Similar provision in the Money Laundering Prohibition Act 2012 (as amended) also empowers the EFCC Chairman or his representatives to place a stop order on any account or transaction suspected to be involved in any crime. “The intendment of these provisions is to ensure that the Commission safeguards suspected proceeds of crime pending the completion of its investigation. It is without prejudice to the social standing of the holder of such accounts or whether they are individual, corporate or government accounts.